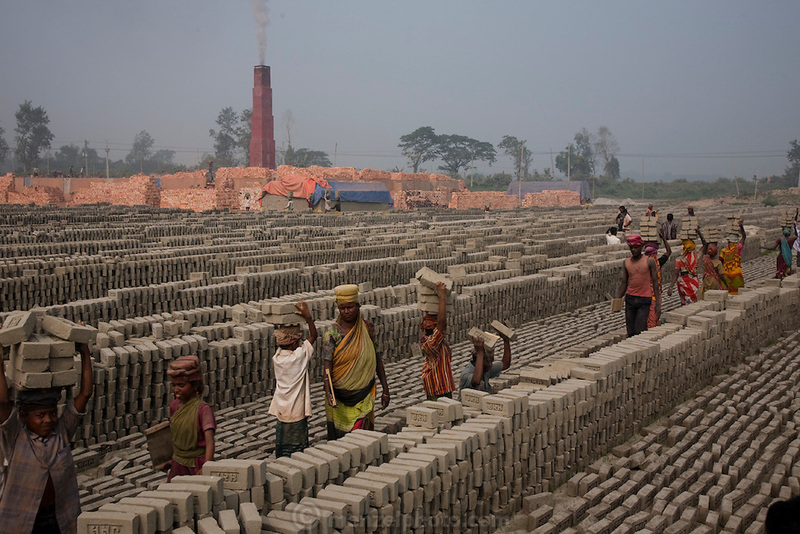 Factory workers carry bricks at the JRB brick factory near Sonargaon, outside Dhaka, Bangladesh. The heavy clay soils along the river near the market town of Sonargaon are well suited for making bricks. At the JRB brick factory, workers of all ages move raw bricks from long, stacked rows, where they first dry in the sun, to the smoky coal-fired kilns. After being fired, the bricks turn red. A foreman keeps tally, handing the workers colored plastic tokens corresponding to the number of bricks they carry past him. They cash in the chips at the end of each shift, taking home the equivalent of $2 to $4 (USD) a day.